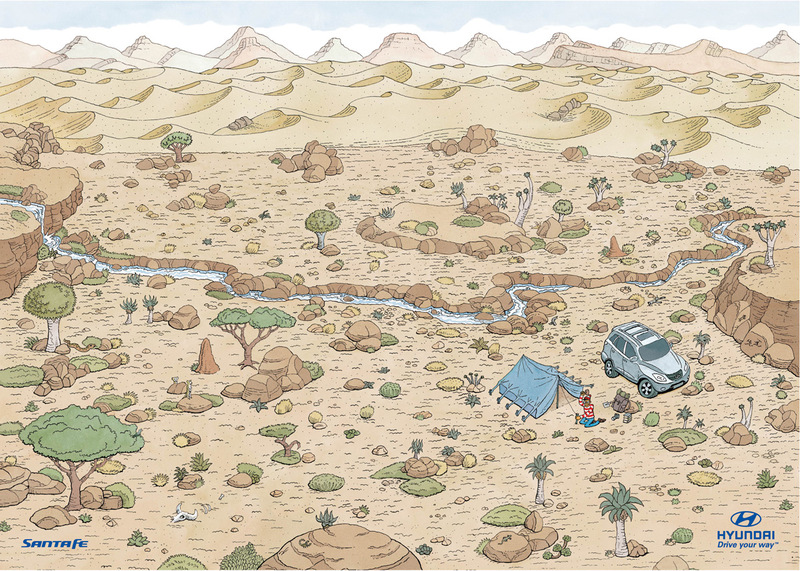 Hyundai South Africa promoted the Santa Fe as the vehicle for fantastic journeys in their “Where’s Wally” series of print advertisements (“Where’s Waldo” for North American readers). Readers familiar with Martin Handford’s series of illustrated books would instantly recognise Wally in the posters by his red and white striped hat and top, blue jeans and goggles. The only difference is that Wally is alone. 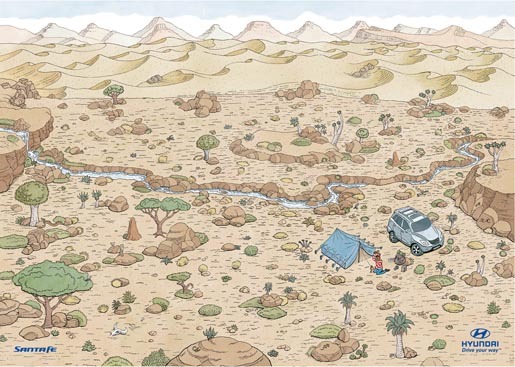 On most pages of the Where’s Wally books, Wally is surrounded by hundreds of other characters. 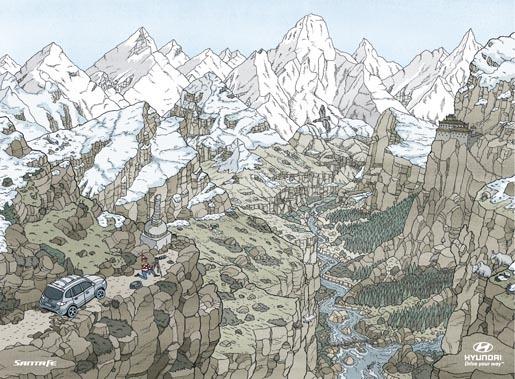 In this set of three newspaper advertisements Wally has made his way alone to the mountains of Tibet, the rain forest of the Amazon and the Kalahari Desert. 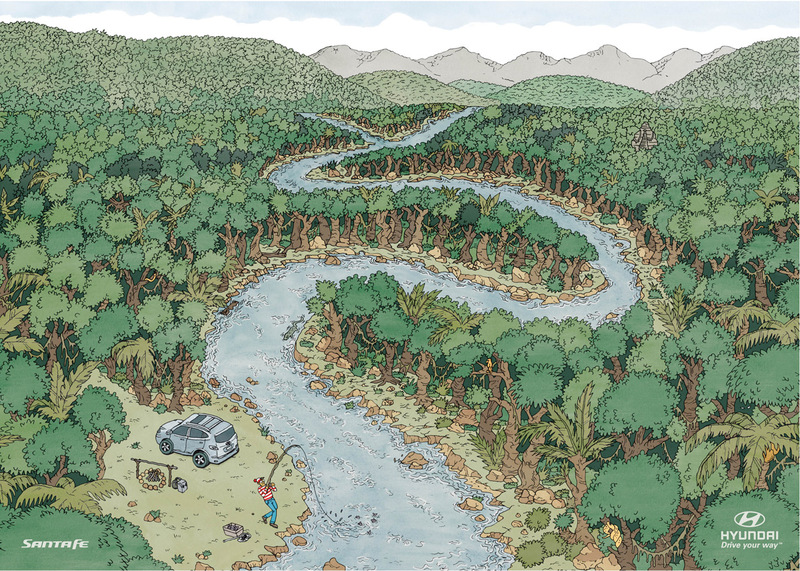 The Hyundai Santa Fe “Where’s Wally” campaign was developed at The Jupiter Drawing Room, Capetown, by creative director Livio Tronchin, art director Jamie Mietz and copywriter Khaya Dlanga. Martin Handford, British illustrator, started writing and illustrating the “Where’s Wally” series for Walker Books in 1987, eventually coming out with six books, along with notebooks, pillows, posters, video games, a syndicated comic strip and an animated TV series. The first book to be released in the United States and Canada, “Where’s Waldo?”, was banned in many libraries because of an exposed woman in the beach scene. The second release of the book in 1997 had her covered up.